The theme – Victorian or Afternoon Tea Party was suggested by Sid's Sea Palm Cooking. Sid has been a fabulous supporter of Food on Friday – she does a heap of interesting cooking including dishes from her Danish heritage like Mazarin Tarts- go check them out. 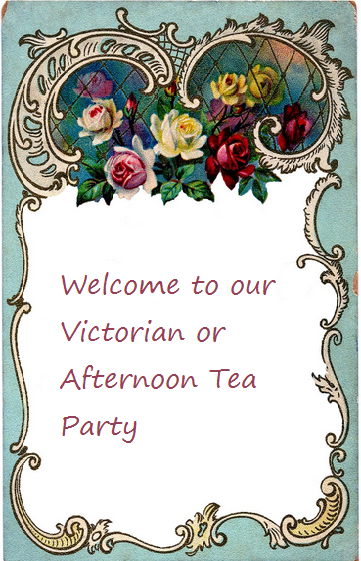 So the idea for this Food on Friday is to have an old style afternoon tea party – whatever that means to you! No idea will be rejected! Now it's time for tea! And thanks, Sid, for the idea. Thanks Carole for hosting. I brought some pecan tassies that are very easy. Welsh Cakes ( # 13 ) are great served warm with butter. Carole, I'm all about afternoon tea! Would love to put the kettle on and give you a tea sandwich and scone! Thanks again for inviting me to participate Carole. Great theme. I've brought you three cake recipes and a biscuit recipe - that should help your tea along. :D Thanks! Hi Carole and old recipe for macaroons this week. How delighful! This week Fragrant Coconut, Lime & Rosemary Cake. I need to get my kitchen finished so I have some new recipes in my arsenal! I was a little bit busy yesterday, had 24 people in for Thanksgiving dinner, but I'm here now with a few recipes. Can't wait to get some more recipes from all the wonderful people who share here. Hi Carole! Thanks for hosting! I hope you have a good week. Good Evening Carole, I haver brought along my English Scone recipe... what could be more perfect for an after tea party. I found a couple more recipes I think would go well with an afternoon tea. Just had to add them. I've started off with a radish sandwich spread, because when I've had high tea it hasn't been all sweets. But it was mostly sweets, so I've linked up 3 more cookies that are terrific with (and one made from) tea. Then I got to thinking--when it's hot out, I find hot tea too much. I prefer iced chai tea lattes (actually, I am drinking them year round) so I've linked up that recipe as well.